Honor Magic 2 was one of the more exciting announcements made by the Huawei sub-brand at its IFA event in Berlin back in August this year. This upcoming smartphone from Honor has now been teased again and is expected to witness an official unveiling on October 31. To recall, the smartphone teased and shown off by Honor President George Zhao at the IFA trade show, but was never officially unveiled. Key highlights of the smartphone include the latest HiSilicon Kirin 980 SoC, an all-screen display with a camera slider mechanism, and 40W ‘Magic Charge’ technology. The teaser has been posted on Honor’s official Chinese website, and pops up only when you load the homepage. 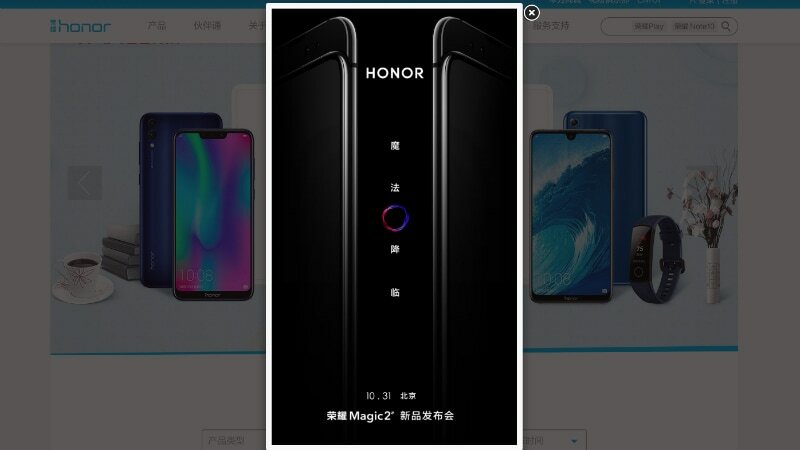 It teases the words “Honor Magic 2 is coming” with the October 31 date. The teaser also mentions that this is the date of the official launch event, putting to rest all doubts. The smartphone is also shown in the teaser, with the camera slider mechanism in action. Apart from that, a post on Weibo claims that the Honor Magic 2 will feature an in-display fingerprint sensor instead of a physical one. It also mentions that the phone will have a high screen-to-body ratio but that is obvious given the bezel-less display that has been teased. From what has been revealed by the company, the Honor Magic 2 is expected to sport the HiSilicon Kirin 980, which is the “world’s first commercial 7nm SoC”. The 7nm process ensures 20 percent improved SoC performance and 40 percent more efficiency. Additionally, the phone is expected to get support for Honor’s upcoming 40W ‘Magic Charge’ fast charging technology with a claimed 15 layers of protection. Interestingly, this launch comes almost two years after the first Honor Magic was unveiled back in December 2016. George Zhao said that the Honor Magic 2 has been almost two years in development and is expected to launch with several AI-based enhancements true to a flagship smartphone in 2018.